Taxes are rarely the first thing an entrepreneur considers when they plan a new business. However, they need to be considered before you open your doors for business. This is the time to bring in your trusted tax advisor, your Enrolled Agent to help you make these crucial decisions. Pick a business structure – Deciding how to structure your business is one of the first things you will need to do; A sole proprietorship. a partnership, an S or C corporation etc. Each entity has different tax rules and filing requirements so you will want to get expert advice before deciding. Pick a tax year – How and when a business files its taxes is determined by its tax year, which can either be a calendar year or a fiscal year f any 12 consecutive months. Calendar years is required for businesses with no books/records, an annual accounting period or other circumstances laid out in the IRS code or income tax regulations. Know what your business tax responsibility is – There are four general types of business taxes. They are income tax, self-employment tax, employment tax, and excise tax. In most cases, the types of tax your business pays depends on the type of business structure you set up. You may need to make estimated tax If you do, use IRS Direct Pay to pay them. Register for you EIN number – You might need an EIN number to identify yourself as a business entity when interacting with the government. Select your accounting method – Yu will need to select an accounting method to determine when to report income and expenses. You must use a consistent method. The two that are most common are the cash and accrual methods. Under the cash method, you normally report income and deduct expenses in the year that you receive or pay them. Under the accrual method, you generally report income and deduct expenses in the year that you earn or incur them. This is true even if you get the income or pay the expense in a later year. 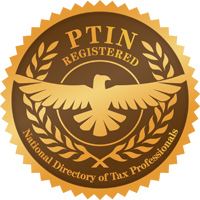 Seek guidance from your tax professional before deciding. Keeping good records – Keep in the habit of keeping good books. It helps monitor your income; track your deductible expenses; substantiate purchases, sales, payroll and other transactions. It will also be less costly at the years end when you meet with your EA or tax professional for your tax preparation.